Salt Lake City has always been a gathering place. This was true when Brigham Young was wheeled into the valley in July of 1847, and it continues to be true today. Initially, it appealed to Mormons who were seeking the spiritually likeminded. Eventually, pockets of diverse communities formed and became anchor points for those who had left the old country in search of the familiar. This was quite true for the local Greek community: As immigrants tended to bring their traditions of food and hospitality with them, the Greek hamburger restaurant was born. Apollo Burger was founded by the Ziouras family in 1984. It wasn’t the first Greek burger joint to open in Salt Lake, but it has become one of the more successful. In the more than 30 years since, their formula of quick service paired with quality, affordable food has allowed the local franchise to grow to include 13 restaurants from St. George to North Salt Lake. There are several locations all along the Wasatch Front, the newest of which is the former Royal Eatery location in downtown Salt Lake City. They’ve even recently brought a food truck into the fold. As Apollo Burger has become my go-to stop for everything burger-related, I thought it timely that I pen this review for the pages of SLUG. One thing that many of our Salt Lake–based, Greek-American restaurants have in common is the tradition of topping a cheeseburger with a hefty pile of pastrami. 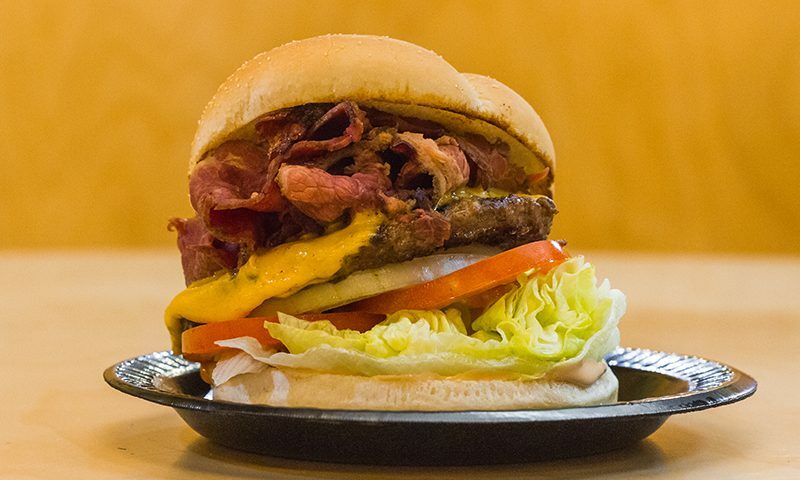 Apollo Burger’s signature sandwich, the appropriately named Apollo Burger ($5.49), takes a quarter-pound, flame-broiled hamburger patty and tops it with melted American cheese and savory, tender pastrami. The burger is finished with lettuce, slices of onion and tomato, and their all-purpose, creamy fry sauce. I almost always order this one. Maybe I’m drawn in by the thickly sliced pastrami, dyed dark red from soaking in the paprika-rich broth. Maybe it’s how the veggies add a freshness and crunch to the burger. Maybe it’s the idea of meat topped with more meat that isn’t bacon. 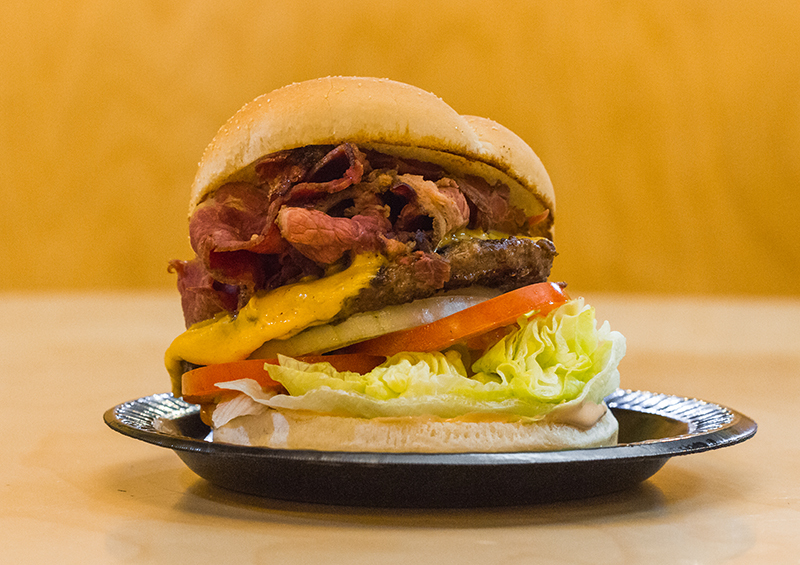 Whatever the reason, the burger always hits home. Those who crave these familiar flavors but want to change it up a bit should try the Golden Burger ($5.69). This one keeps all of the good stuff from the namesake burger but swaps out the seeded bun for two slices of Texas toast. The only reason I don’t order this patty-melt-style sandwich more often is that it can be a little messy to eat with your hands. If you’re not above eating a sandwich with a knife and fork, this may become your next favorite dinner staple. For the adventurous, other favorites include the Athenian Burger ($6.49), layered with broiled red peppers, Feta Cheese and homemade cucumber yogurt sauce; the Tangy Bleu Bacon Burger ($6.49), which adds thick, sliced bacon and both bleu cheese crumbles and bleu cheese dressing; and the recently rebranded Texas Bacon Cheeseburger ($5.69). This last one, formerly called the Western Bacon Cheeseburger, comes layered with bacon, crispy, breaded onion rings, melted American cheese and a hickory BBQ sauce. It’s a great burger—the onion rings add a little earthiness without being overpowering, and the richness of the bacon is balanced out well by the juicy hamburger patty. When I stray from the pastrami burger, this is usually what I order. The burger’s name and look recently ruffled the feathers of national Carl’s Jr. chain, which offers an almost identical burger. A copyright infringement lawsuit, requesting a name change and payment for damages, was still working its way through the court system at the time of this writing. If we were to focus only on the burgers, and this would be easy to do, we would miss so many of the other distinctive things that Apollo Burger offers its customers. In addition to burger-shop mainstays like French fries ($2.49-$3.99), Apollo also serves Sweet Potato Fries ($3,99), Onion Rings ($3.99), Fried Zucchini ($4.49) and Fried Mushrooms ($4.49). The mushrooms are a personal favorite, known for their crisp exterior and almost steamed center that would probably be healthy, if it weren’t for the side of ranch dressing I slather them in. Not ones to shy away from the health-conscious, Apollo also serve up a variety of hand-tossed, fresh salads. A simple side salad will set you back $2.49. The more gourmet varieties, like the Broiled or Crispy Chicken Salad, will run you $7.99. Each of these places the aforementioned chicken over a freshly chopped romaine salad mix, diced cucumbers, tomatoes and green peppers, with a sliced hardboiled egg and a carrot flame. When I feel the need to stray from the burger menu, I usually opt for the Greek Salad ($7.99). This one starts with a romaine salad mix and is topped with crumbled Greek Feta cheese, finely chopped red onions, diced cucumbers, tomatoes and green peppers. They also add pepperoncini peppers, Kalamata olives and a carrot flame. The whole thing is tossed with oregano and Greek salad dressing. I’m not sure if it’s healthy, but it sure does taste great. Apollo Burger has succeeded in its quest to give Utah families quality food and quick service, all at an affordable price. I take comfort in knowing that, as they continue to expand and push forward, there will be quality hamburger restaurants in Salt Lake for generations to come.